Android does not have the new emoji set yet, but WhatsApp has gone ahead and added support for it within its app. WhatsApp has always been using Apple’s emoji set, so it probably wasn’t a lot of work for them to implement it in their Android app. As on iOS, emojis that support multi-color options can be pressed and held to show additional options. It will automatically do that the first time you click on a face and whichever color you choose becomes your default until you manually change it. 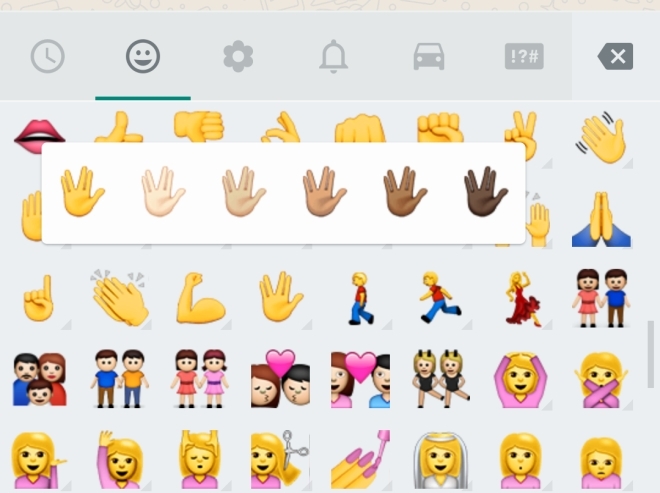 Aside from that, WhatsApp also added support for the Vulcan salute emoji, which was also added in iOS and OS X but disabled for some reason by Apple. If you manage to enable it using the convoluted trick, your friends on Android can now see it in WhatsApp. Moreover, they can send it back much easier as it just appears in the emoji drawer. All this is still limited to the beta available directly through the WhatsApp website, as the Play Store version is rarely up to date with features. You will need to download that if you wish to acquire these emojis. Do note that your friends on Android also need to have the latest update to see these new emoji.